Want to become a professional software geek? then this is the right place to get ebooks to begin with. is widely used in Programming Linux, Windows and OS. 2. C++ PROGRAMMING :- C++ is the Next Generation of C. C and C++ not having much difference but C++ is popular nowadays coz, easy to understand and easy to learn C++ instead of C. C++ is from same category of Software Programming, Mostly whatever program we use in Computer are designed and Created into C++, I would prefer you to learn C++ Instead of C.
4. JAVA PROGRAMMING :- I hope you might have heard what is Java, and what are the uses of Java, if you don't know Download Java and While Installing you'll see it will tell it's own features that Java run more then billions of Electronics and every Connection and Programs, Java is there, Java is High Level Programming Lanugage. Java is also very useful but I would prefer you to learn Java Basic to have knowledge of Java Programming. 6. PHP + SQL + SQLI PROGRAMMING :- As you know that SQL is a Programming lang. of Database (Structured Query Language) without SQL, we can't login to any website and access our files. SQL is the most useable Pogramming lang. SQL is only use for Database Structuring storing info data. Now PHP (Hypertext Pre-processor or Personal Home Page) PHP is widely used in web applications to connect with Server, Web Applications and SQL DB. PHP is really very useful in Web Programming world, without PHP there could be nothing. Every Hackers need to learn PHP,SQL and SQLI (SQL Injection). 8. 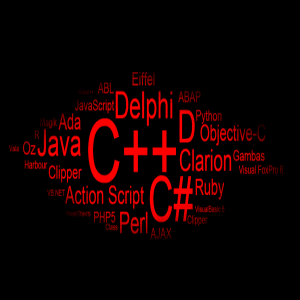 VISUAL C++ SOFTWARE PROGRAMMING :- Visual C++ is the mixture and combination of Visual basic and C++ this is called Visual C++, when you've make a advance Software that interface with users and also have Good Programming Structure then Programmers always use Visual C++ for Windows Software developement. 9. PYTHON :- Python is one of the most advance and Most adorable Programming language it. It's just awesome since from 1990's. Python is a high level programming language which increasingly popular. I have collected Some Beginners and Medum level Python Programming E-books free which contains lots of exercises, practices, example programs and many more. I hope you'll like and Share it. 10. BATCH FILE PROGRAMMING ( MS-DOS ) :- If you're Geek & learning CMD & MS-DOS Programming or going for C++ or Advance programming language then I'll prefer you to start with Batch File Programming it's easy to understand and simple coding method with simple tricks and many cool stuffs, it's the first step to Enter's into MS-DOS world. Batch file is commonly useful while using Windows Platform OS. 11. ANDROID SOFTWARE DEVELOPMENT ( APPS ) :- Android is the biggest and largest Mobile OS running on our Planet, Android run Millions of Gadgets, Smart Phones and therefore Android Apps are widely used everywhere there are millions of Developer develop apps daily and Publish on Google Play and Earn Money, Even you can do that and earn money, but first of all you'll require Android App Dev Kit and tutorials to dev Android Apps, Here I'd collected some E-books to make Android Apps and Learn Android Software Programming. 12. DOT NET ( .NET ) PROGRAMMING :- .NET - The .NET Framework is a new computing platform developed by Microsoft that simplifies application development in the highly distributed environment of the internet. .NET is much more than just a platform for developing for the internet, but it is intended for this purpose predominantly, because here, others methods have failed in the past.